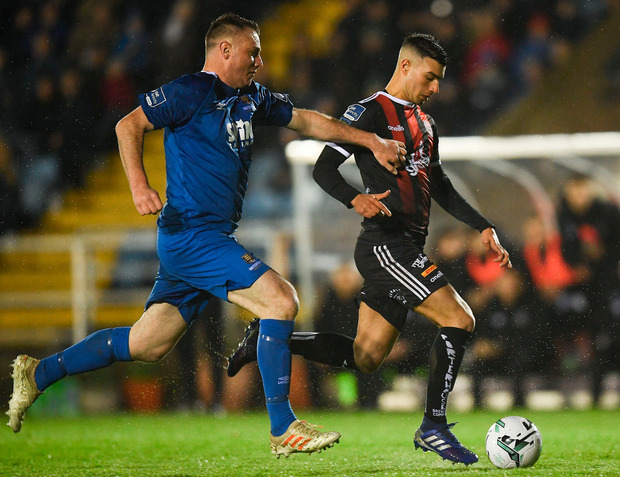 It was rain rather than goals hailing down last night at the RSC as Bohemians eked out a draw to remain in top spot. Released Ali Reghba, on the pitch just two minutes to replace the injured Luke Wade-Slater, was released on goal by Dinny Corcoran, yet could only slice his low effort into the side-netting. WATERFORD - H Keta; G Poynton, K Browne, D Delaney, R Feely; S Duggan, JJ Lunney; Z Elbouzedi, B Héry (K Chvedukas 70), C Galvin (S Twine 46); I Akinade (A Drinan 79). BOHEMIANS - J Talbot; D Pender, R Cornwall, J Finnerty D Leahy; L Wade-Slater (A Reghba 28), K Buckley; C Levingston, D Mandroiu, K Ward (R Swan 76); D Corcoran.